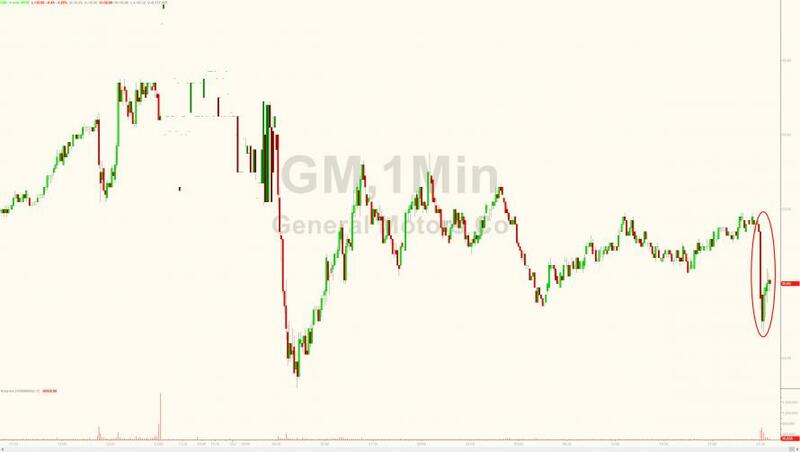 When GM surprised the market several months ago with its announcement that, unlike most other US automakers, it would stop disclosing monthly sales, some immediately saw through this as a thinly veiled confirmation that pain is coming. Nowhere was that more obvious than in the company's August sales, which while undisclosed, predictably leaked with Bloomberg reporting that in the last month, GM sales plunged 13% for the same reason most other automakers saw a sharp drop in July sales: a sharp pull back on sales incentives, especially for full-size pickups. 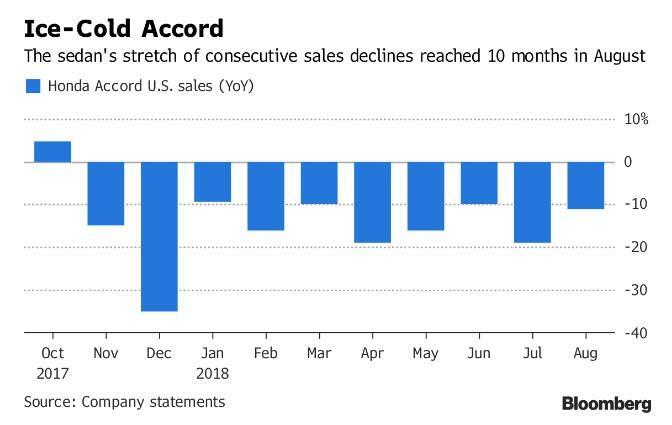 In addition to the biggest drop in years, GM's total sales also missed analysts’ average estimate for a decline of 7.7%. Speaking to Bloomberg, company spokesman Jim Cain refused to comment on the sales drop, but he did confirm that GM dialed back discounts during the month. The report extended the decline for GM shares, which dropped 1.3% to $35.58. The stock is now down 13% YTD. Meanwhile, other OEMs also reported weak August results: with the exception of Ford Motor, all other major automakers also reported sales that trailed analysts’ estimates, as demand for passenger cars including the Honda Accord and Toyota Camry plunged. Looking over the past month, Honda was perhaps the best indicator of the tectonic shifts in the US auto market: as Bloomberg notes, the Japanese automaker extended "a bleak stretch" for a car model widely regarded as one of the best on the U.S. market, showing just how swiftly consumer demand has shifted to SUVs and away from sedans. Total deliveries for Honda rose 1.3% last month, missing estimates, and while Honda SUVs - including the Honda Pilot and Acura RDX - are setting sales records, the Accord’s 11% drop just how loathed sedans have become, as the sales drop has now extended for a dismal 10 consecutive months for the award-winning Accord. Sedan sales also slumped for Toyota and Ford as consumers snubbed traditional favorite models like the Camry and Fusion, picking SUVs instead. The revulsion to passenger cars has been so extensive, that according to Michelle Krebs, senior analyst with AutoTrader, the segment may have plunged to just 29% of the market in August, which would be an all-time low. Five years ago, sedans were 49% of industry-wide deliveries, she said. "If it continues to slide, then one wonders how low it can go," Krebs said of the sedan market. "We were anticipating passengers cars would make up 30 percent of the market this year and that may have been optimistic." The silver lining for automakers is that as sedan sales have collapsed, overall US car demand has been a little better than analysts anticipated entering the year, thanks to surging demand for roomy and fuel-efficient SUVs. 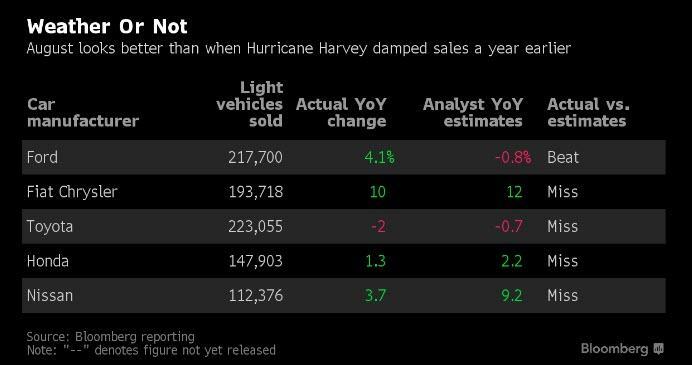 The seasonally adjusted annualized rate of sales in August probably accelerated to 16.8 million according to Bloomberg, from 16.6 million a year ago, when Hurricane Harvey crippled deliveries to Texas’s gulf coast.